Model Ship Gallery - Add Your Model Boat Pictures Here! Here is the Model Ship Gallery where you can add pictures and a story about model boats built from plans or kits - kit-bashed or from scratch - by you, someone you know or one you've seen at a museum. 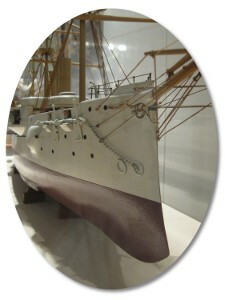 A model ship gallery can provide the inspiration, boost and motivation for any model builder to plow ahead with a project. This is also a good place to find inspiration for your next project. You can use the "comment" feature to ask questions and/or vote for the model you like the best. Loosing steam half-way through a kit or scratch build happens to the best of us. Pictures and stories from other builders is a great aid in getting passed these inspirational dry-spells. This is also a great place to review and share your opinion about a kit you finished, and let others know how delighted you were, or flat disappointed. There is no better contribution to the model boats building community than to recommend a good product, or warn about a miserable one. Any and all submissions will be considered. However, all I ask is that the model boats are finished - no works in progress, please. In any case, let's have fun with this one and see what YOU will bring. Do you have a model ship to show off? If you have built a model boat, ship or submarine - here is your chance to share it and let us admire it! Here are some tips on what boat nuts like myself would like to know. These are just ideas, but feel free to go above-and-beyond, and don't feel bad taking well deserved credit! Built or modified a kit? Include things like: Manufacturer's name, type of kit (plastic, resin, solid wood, paper, plank-on-frame etc). Include your overall impression of the kit: What is it's strengths and weaknesses? Would you recommend it to a friend? Is the model built from a plan? Where did you find the plan? What other information did you use (if any)? Why did you pick this particular boat or ship? What material did you use? Give us a brief history of the ship and why you chose it. What year was it launched? What was it's fate and/or claim-to-fame? In general: What scale is the model built to and/or how big is it? Choices you made in materials and techniques? Is it meant for RC, war gaming (including RC Warship Combat), static, diorama, waterline, science project etc. Everybody loves pictures. Besides, what's a gallery without pictures? Feed them to the wolves!